MEREDITH OF THE PAPERY CRAFTERY. — The Higgins Creative. MEREDITH OF THE PAPERY CRAFTERY. Join us in welcoming Meredith Amand to the blog! We had the privilege of ordering a custom quilling of our logo from her and WE LOVE. Her ability to work in even the smallest details is just amazing. Q: Hey Meredith! Tell us about yourself! A: My name is Meredith Amand, owner and creator for The Papery Craftery, my handmade quilled paper home decor and gift company. I'm also a full-time mama to my 2 kiddos, who I call Moose & the Bean. I started quilling about 6 years ago, after I graduated from art school, and I was looking for a way to keep my creative juices flowing. I majored in ceramics, but that's not the most practical (or inexpensive) craft to produce. After playing around with quilling tools and paper for a little while, I was hooked! Since I'm a self-taught quiller, I've developed my own style, and I love recreating everyday objects into whimsical, paper designs. Q: What makes you want to create? What keeps you going? A: I love the magic of paper. Most people might think that paper is really fragile, but when you work with it, rolling and shaping, you'd be amazed at it's power. And quilling something new, like a new veggie or a crazy custom order, is like a game to me. It's a challenge that I get to try to figure out! Q: What has been the most challenging part of your business? A: Time management is my eternal struggle. I have tons of to-do lists, tons of ideas, but sometimes there is just not enough hours to get everything done that I would like. But, what keeps me sane, is the thought that I am only able to be as successful as the universe is allowing me to be at this time. One day, I will have more hours in my day that I can devote totally to work, but for now, I steal snippets when I can, and I am happy with that. Q: How can people follow you and keep up on your work? A: My blog is ThePaperyCraftery.com, where I feature quilling tutorials, creative micro-business tips and awesome paper crafting news! I do have a newsletter, so everyone can keep up to date. I'm also on Instagram @thepaperycraftery and Facebook as The Papery Craftery. Q: What advice do you have for those thinking about starting us their own micro-biz? A: If the idea you have drives you, keeps you up at night, consumes all your thoughts...just do it! It's really worth a shot. Granted, it will probably be a lot more work than you thought it might be, but it will be totally worth it! Be sure to check out Meredith's work and sign up for her newsletter to stay updated, and leave her some love in the comments below. Thanks for sharing your heart and passion for creating with us, Meredith! 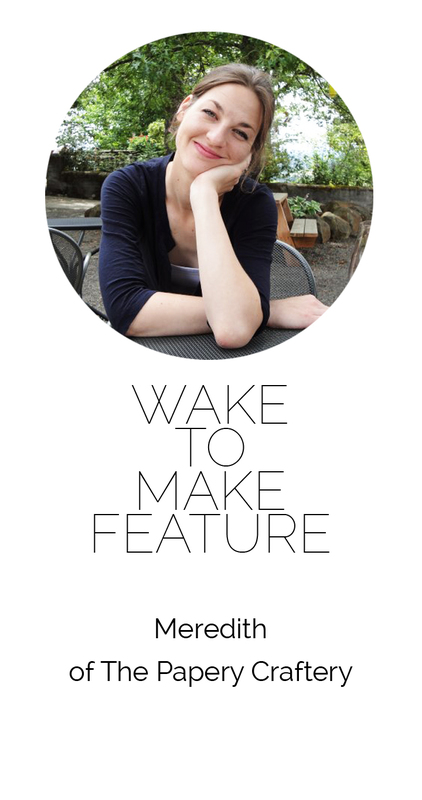 If you are interested in being featured as a #waketomakefeature, visit our submissions page above! What do you #waketomake? SIDNEY OF SIDNEY HUNTER DESIGN CO.